The below letter is an excerpt from No-Drama Discipline by Daniel J. Siegel, M.D. and Tina Payne Bryson, Ph.D. If you're a fan of No Drama Discipline and want the people who help you care for your children to know about your discipline approach, then keep reading. 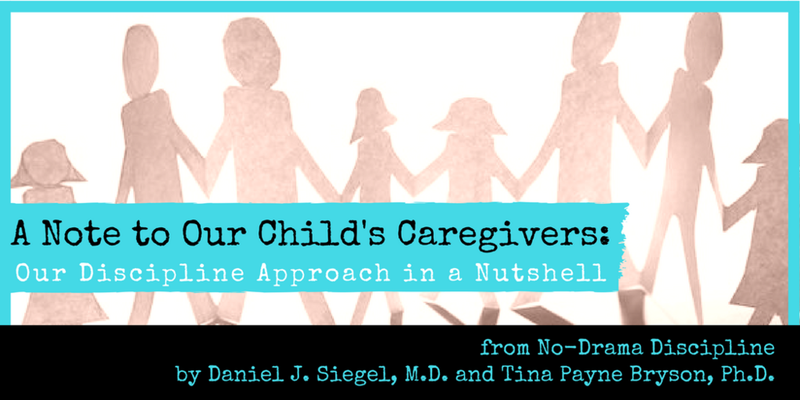 This letter was written for grandparents, friends, babysitters, nannies, and other caregivers who haven't read the book. You are an important person in the life of our child or children. You're helping determine who they’re becoming by shaping their hearts, minds, character, and even the structures of their brains! Because we share this incredible privilege and responsibility of teaching them how to make good choices and how to be kind, successful human beings, we want to also share with you how we handle behavioral challenges, in hopes that we can work together give our children a consistent, effective experience when it comes to discipline. Discipline is essential. We believe that loving our kids, and giving them what they need, includes setting clear and consistent boundaries and holding high expectations for them—all of which helps them achieve success in relationships and other areas of their lives. Effective discipline depends on a loving, respectful relationship between adult and child. Discipline should never include threats or humiliation, cause physical pain, scare children, or make them feel that the adult is the enemy. Discipline should feel safe and loving to everyone involved. The goal of discipline is to teach. We use discipline moments to build skills so kids can handle themselves better now and make better decisions in the future. There are usually better ways to teach than giving immediate consequences. Instead of punishment, we encourage cooperation from our kids by helping them think about their actions, and by being creative and playful. We set limits by having a conversation to help develop awareness and skills that lead to better behavior both today and tomorrow. The first step in discipline is to pay attention to kids' emotions. When children misbehave, it's usually the result of not handling big feelings well and not yet having the skills to make good choices. So being attentive to their emotional experience behind a behavior is just as important as the behavior itself. In fact, science shows that addressing kids' emotional needs is actually the most effective approach to changing behavior over time, as well as developing their brains in ways that allow them to handle themselves better as they grow up. When children are upset or throwing a fit, that's when they need us most. We need to show them we are there for them, and that we'll be there for them at their absolute worst. This is how we build trust and a feeling of overall safety. Sometimes we need to wait until children are ready to learn. If kids are upset or out of control, that's the worst time to try to teach them. Those big emotions are evidence that our children need us. So our first job is to help them calm down, so they can regain control and handle themselves well. The way we help them be ready to learn is to connect with them. Before we redirect their behavior, we connect and comfort. Just like we soothe them when they are physically hurt, we do the same when they're emotionally upset. We do this by validating their feelings, and by giving them lots of nurturing empathy. Before we teach, we connect. After connecting, we redirect. Once they've felt that connection with us, kids will be more ready to learn, so we can effectively redirect them and talk with them about their behavior. What do we hope to accomplish when we redirect and set limits? We want our kids to gain insight into themselves, empathy for others, and the ability to make things right when they make mistakes. For us, discipline comes down to one simple phrase: Connect and Redirect. Our first response should always be to offer soothing connection, then we can redirect behaviors. Even when we say "no" to children's behavior, we always want to say "yes" to their emotions, and to the way they experience things.